During a recent episode of the No Meat Athlete Radio podcast, Matt and I discussed an old post of his called, 3 Reasons Why I’ll Teach My Kids to Run Marathons. In that post, the three reasons he listed were all parenting precepts that can be taught through training for and running a marathon. Praise practice rather than innate ability. Encourage persistence and the ability to postpone gratification. During our discussion, I was reminded of how powerful running can be, and well, that got me thinking about trail running. More specifically, how the discovery of trail running has changed my life. And how it can change yours as well. Not sure what I mean? Here are just a few of the many ways. When I first started running trails, I was living in the middle of a major metropolitan area, Washington, D.C. Looking out my back window, I could see a total of 2 trees, and a patch of grass about 10 feet wide. The big city has its perks, but a relationship to the Earth isn’t one of them. It wasn’t until I discovered the trails in a nearby park (also in the middle of the city, I might add), that I really started feeling that regular connection again. After running sidewalks and roads for so long, it was hopping over roots and working my way through rocky singletrack that reconnected me with nature. Even if you live in a more rural area than I did, getting out on trails will help you get to know your outdoor surroundings and connect to the weather, conditions, and habitat that is so easily forgotten in this modern world. After all, nature is healing and promotes happiness. Why would you want to pass that up? 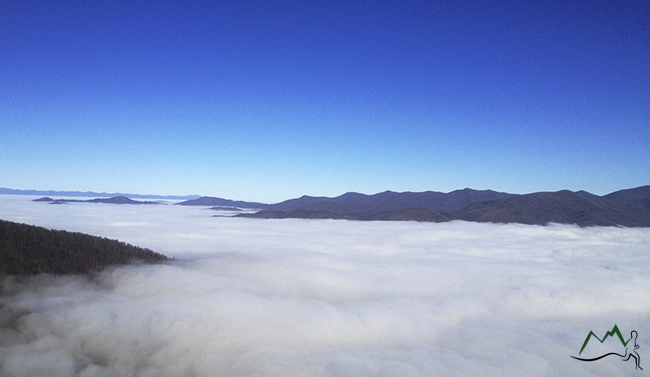 On a recent run with my friend Peter, we left our cars at the base of a mountain smothered in clouds. The weather was threatening rain, but we decided to squeeze in a run anyway. About halfway up the trail, just when we found ourselves in the middle of those clouds, Peter and I began to see light bursting through open pockets. It was a moment I was happy to experience, and one I never would have imagined, had I stuck to the roads that day. Trail running is full of surprises around each turn. Maybe it’s wildlife or wildflowers, or maybe it’s a stunning view you didn’t know existed. Do you remember the first time you heard about someone running an ultramarathon? I do. I thought it was a joke. 50 miles? 100 miles? Yeah right! During my first 50 miler, I didn’t know I could finish until I crossed the finish line. I put on a tough face (and leaned on my pacer), but I had doubts with each step. When I finally crossed that line, I burst in to tears. My wife still says she hasn’t seen me cry like that since. I pushed past where I believed possible and discovered a whole new world. It was a moment of release and triumph. If I could do that, I could do so many things I once believed to be impossible. Suddenly, the limits I had set were no longer valid, and I’ve kept pushing them since. Ask any ultrarunner and they’ll tell you that pushing your limits in an ultra is only part of it. Once you see what’s possible through running, you begin questioning the impossible in other aspects of life. Could I run my own business or get my dream job? Could I lose the weight I’ve been afraid to attempt? Could I learn to play the instrument I always thought to be too hard? For so many runners, that initial questioning of the impossible started with a single trail run. At first the trail seemed impossible. Then the race. Then the next race. Suddenly, all these things that were once out of reach happened on a regular basis. And for the ever growing number of ultrarunners, it’s transforming their thinking completely. Do you get bored on your runs? Do you find yourself regularly injured? Is motivation an issue when it comes to running? Are you tired of crowded sidewalks or waiting at crosswalks? If you answered yes to any of these, you should probably try trail running. I was answering yes to all of those, and I was about to quit running. Running trails can break the monotony of the road and help prevent injury, and the new challenges might just lead to more motivation. Best of all, there are no sidewalks or crosswalks. I owe the fact that I’m still running completely to trail running. When I first gave it a shot, I was struggling to get out and run even 3 miles. I just didn’t have another trip around the block in me. All of a sudden I hit the trails and I was having a blast, excited to go out on my next run, and registering for a 50k. Trail running can do the same for you. Two legitimate, but avoidable, reasons. So it got me thinking. The mission behind everything I do here at Rock Creek Runner is to make trail and ultrarunning accessible to anyone willing to give it a shot. I know firsthand how transformative the sport can be to your entire life. I couldn’t let something so easily avoidable as fear and lack of knowledge hold people back. Over the past several months I’ve been tirelessly developing a course to help you run trails, and arm you with the tools you need to enter the world of trail marathons and ultramarathons. It’ll help remove your fear and give you knowledge to get started. To do so, I’ve interviewed nearly a dozen experts who give you access to their skills. All in an effort to not only share my advice and experience, but their’s too. I hate to do this, but that’s all I can say for now. If you’re ready to start running trails, or tackle your first trail marathon or ultramarathon, there’s no better time to do it. Click here to sign up for free information on how you can get started, and to hear special clips from a few of those experts. Signing up will also give you access to exclusive offers, bonuses, and priority once the course is completely ready in just over a week. It’s time you discover new limits. It’s time to change your life. It’s time to start trail running.